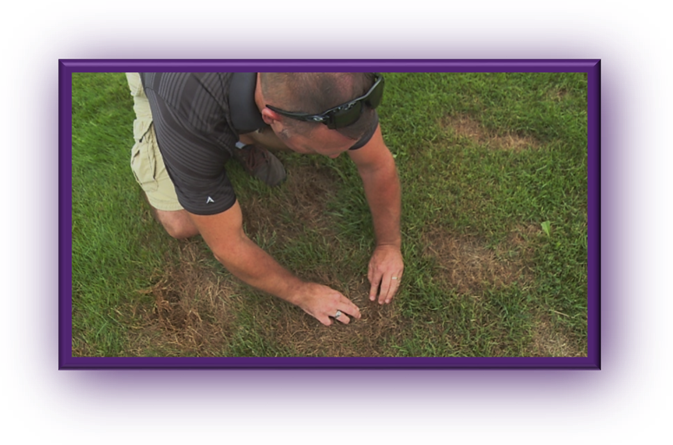 Photo ― Mr Rob Gallant of Atlantic Graduate Pest Management inspects a lawn that was damaged by Chinch Bugs. During summer 2016, INEFFICIENCIES with Stratford’s Anti-Pesticide PROHIBITION are allowing Chinch Bugs to damage more lawns than in the past, says the owner of a business operating in the Professional Lawn Care Industry. Since January 1st, 2016, these licensed businesses have ARBITRARILY PROHIBITED from applying conventional pest control products in Stratford’s Urban Landscape. Stratford is a suburban town located in central Prince Edward Island ( PEI ), with a population of over 8500. 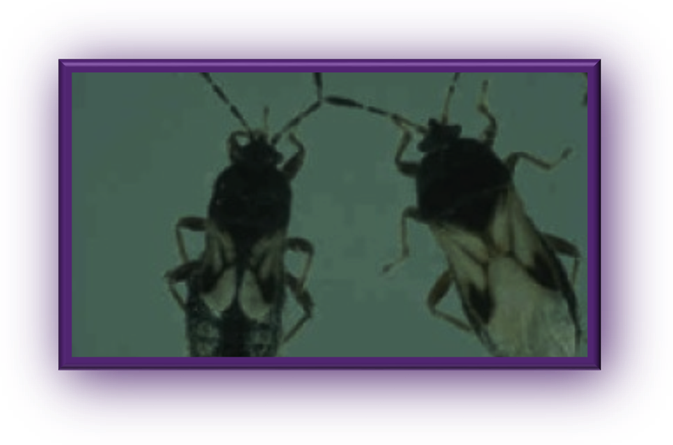 The exception is SPECIAL PERMITS for cases of CHINCH BUG INFESTATIONS. But Mr Rob Gallant said the application process is TOO CUMBERSOME. 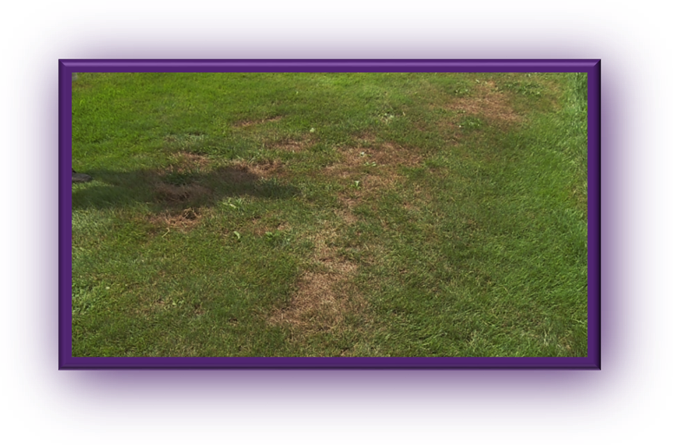 Photo ― A few brown patches on a lawn can spread to the entire yard by the time a SPECIAL PERMIT is complete, says Mr Rob Gallant. « There has been a couple of properties that, because of the process, they have COMPLETELY LOST THEIR PROPERTY, » said Mr Rob Gallant. To apply for a permit, there’s a 50-dollar fee, Mr Gallant has to get the home-owner’s signature, submit it to the town, and wait for an inspection. By that time, he said, IT CAN BE TOO LATE TO SAVE THE LAWN. Photo ― Two adult Chinch Bugs. Stratford’s Anti-Pesticide Lunatic-Mayor David Dunphy says the town has received 21 permit applications, and has sent a worker out within 24 hours each time. « It could be a situation where the applicator may have started his process, and by the time he gets to us it’s taken him about five days to a week, whatever, » said the Truth-Challenged Mayor. NO ONE WANTS THIS #@! !% DANGEROUS BAN NONSENSE THAT PLACES CHILDREN AT RISK IN STRATFORD ! Stratford’s prohibition is arbitrary & discriminatory against ONLY professional lawn care businesses. It implies that … it is safe for children and adults to walk on pesticide-treated golf courses, and eat pesticide-treated food, but it is seemingly NOT safe for them to walk and play on pesticide-treated lawns. The Stratford prohibition specifically discriminates against ONE SPECIFIC TYPE of business. Observers contend that prohibition must apply to EVERYONE. In order to be consistent and fair, there should be NO arbitrary exception statuses for anyone. Stratford’s city council must PROHIBIT ALL PEST CONTROL PRODUCTS from EVERYONE, including fruit & vegetable production, golf facilities, mosquito control, nursery production, orchards, rose gardens, sod production, and sports fields. THERE SHOULD BE NO #@! !% EXCEPTIONS WHATSOEVER ! Otherwise, Stratford’s imminent prohibition is arbitrary & discriminatory. With prohibition against pest control products used in the urban landscape, residents of Stratford, on Prince Edward Island, had better get used to having their CHILDREN SUFFERING MORE AND MORE INJURIES. Any form of prohibition actually harms children and represents a danger to children ! CHILDREN ARE SAFER WITH PESTICIDES ! Because of prohibition, children are forced to play in #@! !% dangerous and pest-infested garbage dumps ! http://wp.me/P1jq40-44g http://wp.me/P1jq40-4z3 http://wp.me/p1jq40-7C4 In essence, children are at risk from dangerous playing surfaces which are created by #@! !% pesticide bans ! For example, in Hamilton, Ontario, children cannot play on the grass because of the proliferation of weeds that occurred because of prohibition. http://tinyurl.com/qh5e7ve Pest control products prevent slipping injuries on sports turf. http://wp.me/P1jq40-2ha Children need pest-free sports fields to avoid falling and hurting themselves. It is impossible for home-owners or professionals to keep the urban landscape safe and beautiful by using so-called green alternative pesticides and practices. http://wp.me/P1jq40-24g In many jurisdictions, government officials are thinking twice about banning pesticides by looking at the experience of those jurisdictions that have suffered the hardship and stunningly exorbitant costs of this #@! !% nonsense ! http://wp.me/P1jq40-43V No one want this #@! !% dangerous & destructive ban nonsense ! WE SPEAK THE TRUTH ABOUT PESTICIDES !